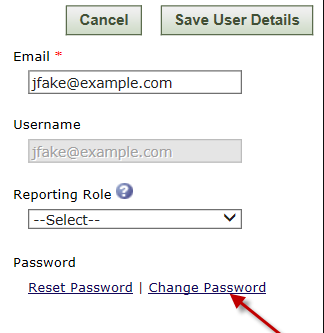 On the navigation bar, select Site Administration, then click Manage User Accounts. Locate the user and click Edit in the Take Action column to the right. 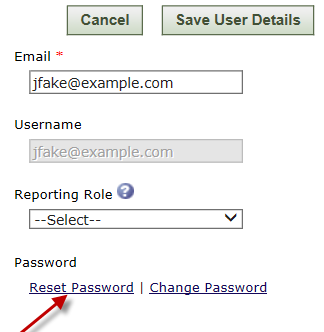 In the center column on the page, under the “Password” label, click the Reset Password link. Have the user check their email; if they do not receive an email within five minutes, please have them check their junk folder. Have the user click on the link provided to reset their password. In the center column on the page, under the “Password” label, click the Change Password link. Type the new password.The new password must be at least 4 and at most 128 characters long; some enterprises may have more stringent password requirements set on the Manage My Enterprise page. Under the Take Action column on the right side, click the Unlock link. Click here for more information on resetting a user's password.